A trio of towers designed by Fender Katsalidis will bring luxury apartments, a five star hotel, destination dining, retail and public amenity to the former Convention Centre site on the corner of Melbourne's Flinders and Spencer Streets. The 4,500sqm site at 7-23 Spencer Street has been dormant for several years after the former Congress Centre/Convention Centre behind Crowne Plaza was demolished. It is a key gateway to the CBD and boasts iconic, east-facing views down the Yarra River. New plans by developer Century Group will see three terraced towers of up to 33 levels designed by Fender Katsalidis, which, says the firm, will revitalise the area with an activated precinct for residents and visitors. Across the three towers, the precinct will feature 500 luxury apartments, 167 five star hotel rooms, 2,100sqm of retail and a vibrant pedestrian precinct and plaza that will contribute to Melbourne’s public art reputation. “Flinders Bank will contribute enormously to the betterment of this part of the city, where a new DNA is emerging and lots of new life is being created,” says Karl Fender, founding partner of Fender Katsalidis. 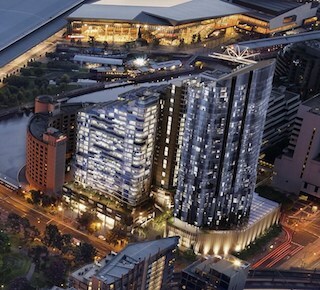 The firm is leading the regeneration of the south-west corner of the city with the adjacent Melbourne Quarter project and Riverlee’s Northbank precinct. When looked at collectively, the three projects will contribute to an expansion of the CBD core and link the city to the Docklands, Fishermans Bend and the ever-growing western suburbs. “Flinders Bank in particular will give something back to Melbourne for the people who live and play here,” says Fender. “The design is inspired by the flow of the nearby Yarra River, and the architecture responds to the site, protecting the riverside from overshadowing through its stepped-back approach,” says Wu. “The Spencer Street façade features an active skin which will add to the sense of vibrancy and activity whilst taking advantage of the existing river views,” she adds. Construction of Flinders Bank is expected to commence in 2019, with the project to be released in three stages and completed in approximately by mid-2021.